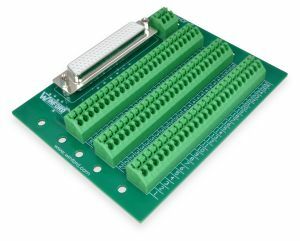 These breakout boards bring all 78 pins of a DB78HD (high density, 4 row) female connector out to spring terminal blocks for easy connection and prototyping work. This breakout board features push-in spring connection terminal blocks. These screwless spring clamp terminal blocks allow connections to be made very quickly and efficiently. The spring terminal connections are reliable and secure, but wires can be connected and disconnected in a fraction of the time required with standard screw terminal blocks. Simply depress the actuator button on top of the terminal block, insert or remove the wire, and release the button. Done! In addition, screwless spring connections can offer better results in environments where vibration could potentially loosen standard screw terminal block connections. If your application requires screw terminals rather than spring terminals, please consider the BRK78HD design. These break out boards are perfect for experimentation and prototype work, as well as for use in the educational laboratory. 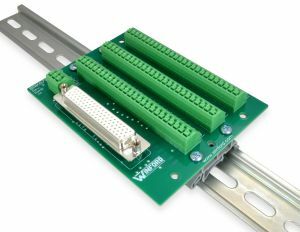 They are well-suited for interfacing with data acquisition (DAQ) equipment or any other devices that use a DB78 connector. A breakout board is sometimes referred to as a "transition module", "terminal board", "terminal block", "breakout box", "breakout adapter", "terminator", or "interface module".